June 1: Sugar Bear at Ballou High School — Teach the Beat! 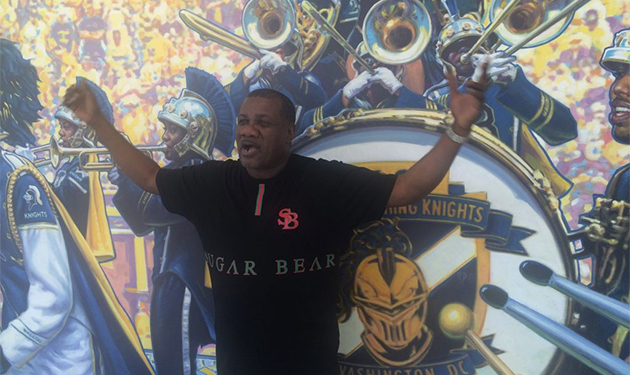 Sugar Bear, a graduate of Ballou, visited the new Ballou High School building for the first time to the delight of the music students in Mr. Watson’s class. When entering the building, staff members shouted “Sugar Bear”! When he entered the classroom, he was greeted with a round of applause from students. After sharing some history of go-go, Sugar Bear said, “Lets jam.” Students jumped up and got their instruments. Over the next hour, Sugar Bar played various tunes with the class. When a new tune was introduced, Mr. Watson and Sugar Bear coached students on how to play it. The visit was funded by Office of the Chief of Schools of DCPS.